Nias lies in a chain of Island west off the coast of Sumatra about one hundred kilometers from the main land, and is occupied by distinct ethnic groups. the Siraha Salawa and the Adu Zatua.The former being an ancestor chief figure and the latter Adu Zatua is representing any deceased ancestor. Typically an Adu Zatua image was made on the death of each Nissan. 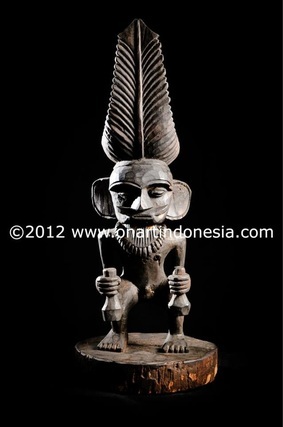 The Nias ancestor Chief figure represents a long-­‐deceased ancestor-­‐Chief, and would have been displayed prominently inside a wealthy Chief’s house as a protective device-­‐ usually they were displayed above the floor and atop a stand in a large room in the house. The fleshy ear lobes, almond-shaped eyes and prominent nose indicates that this figure comes from the North of Nias, and with its crown resembling that of a palm leaf or a fern frond, and blackened wood. is located approximately 125 kilometers off the West coast of Sumatra in the Indonesian archipelago. 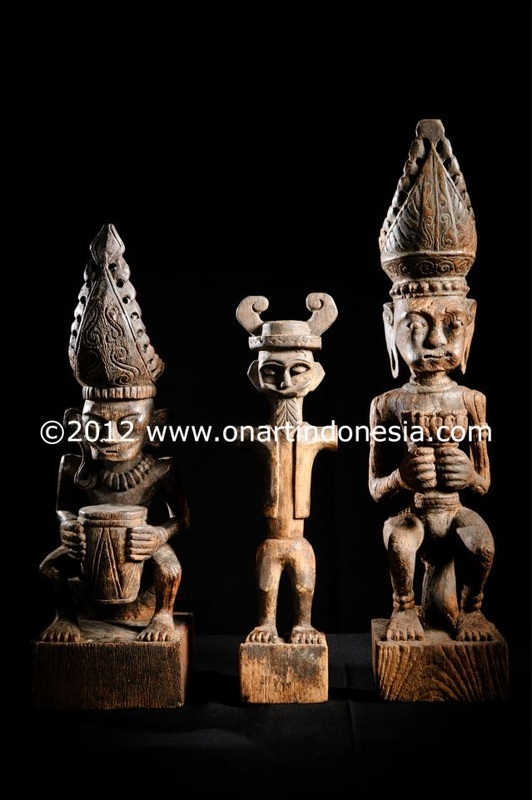 Recent linguistic studies in Nias place the origins of their language closer to Polynesian than Malay, which accounts for their distinctive art style. Adu Zatua, which are also called Siraha Salawa or are most typically effigies of the dead, which are lashed together on an altar to show a family’s lineage. Alternatively, a living person can commission an Adu Zatua to atone for his sins, a practice which led to a proliferation of “sin statues” during the slave trading days of the nineteenth century.The people of Nias keep their ancestral figures indoors and in a place of great respect and honor, thus they do not suffer the ravages of climate as with wooden sculptures kept out-of-doors. This entry was posted on Tuesday, December 31st, 2013 at 9:20 am	and tagged with adu zatua, Art, Asia, Indonesia, List of islands of Indonesia, Nia, Nias, North Nias, Pragya Singh Thakur, Sumatra and posted in Indonesia, OnArtBali - OnArtIndonesia. You can follow any responses to this entry through the RSS 2.0 feed.